Warm Greetings of Peace and Solidarity from NADA Philippines! 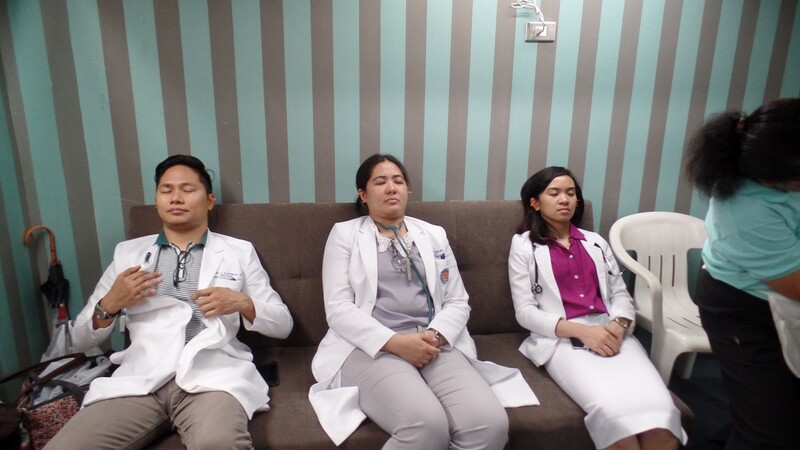 The National Acupuncture Detoxification Association (NADA) Philippines is a non-profit volunteer organization that supports the use of a five-point ear acupuncture protocol known internationally as the NADA Protocol. We are inviting you to be part of this forum that will feature the diverse experiences and updates from the ADSes here and abroad in their continued work in providing ear acupuncture to various communities and sectors. Kindly confirm your attendance to ensure food reservation by sending a text message to Ms. Evelyn Dulay through mobile 0917-7305964 and email evelyndulay06@gmail.com / nadaphilippines@gmail.com. · A Channel of God’s Mercy in the year of the family and the Eucharist. The September-October 2015 issue of Guidepoints featuring the article on NADA at the Philippine Children’s Medical Center is now available. Click here to read the issue. Bank of Philippine Islands (BPI) – Loyola Katipunan Branch. Acct. name is NADA PHILS. Email the scanned deposit slip along with the required details (name, date, venue) to nadaphilippines@gmail.com on or before February 10, 2016 (Wednesday). You will get your certificates at the 5th Annual NADA Forum on February 27, 2016 (Saturday). If you order on Feb. 27 itself, re-printing cost will be Php200.00 and you will receive your certificate after 10-14 days. This year, NADA Philippines collaborated with KYTHE Foundation, a non-profit organization and the only provider of the Child Life Program in the Philippines that delivers psychosocial care in hospitals to indigent children with cancer and chronic illness. 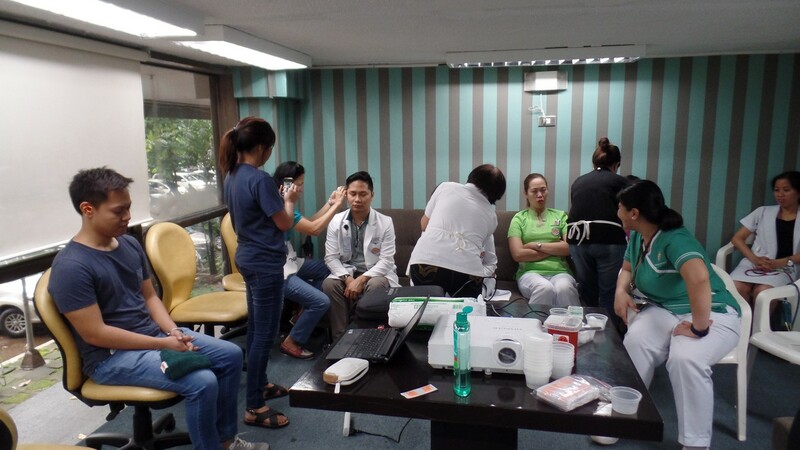 This is the first time that a group such as NADA Philippines has offered to give free ear acudetox treatments to the parents and caregivers of these indigent children at the Philippine Children’s Medical Center Hospital (PCMC). It is our aim to somehow alleviate the suffering of the parents and caregivers by giving them some space even for 20-30 minutes sitting down during their acudetox treatment, while their children are being treated at the hospital. This is also a two way process, wherein the acudetox specialists also learn from the sharing of stories from parents and caregivers and from the children themselves. Kythe flies with NADA: Calling all ADS volunteers! We are inviting NADA ADSes who are willing to volunteer their services for the NADA Philippines-Kythe Foundation partnership project, “Kythe flies with NADA,” to come join us on October 23 & 30 (Fridays), 2-4pm at PCMC to give treatments to the parents and caregivers of indigent children with cancer (leukemia, thalassemia, blood problems). For those who are volunteering, kindly send us a text at 0908-369-1598. 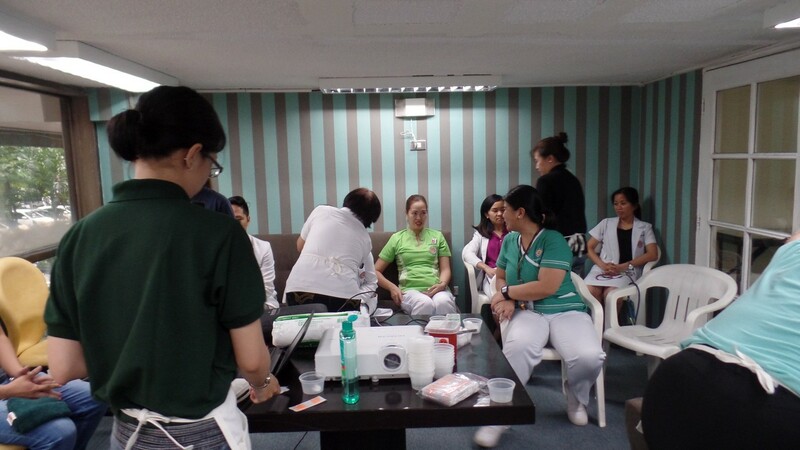 This was our NADA orientation and demonstration last August 20 at the Hematology and Cancer department conference room of PCMC. 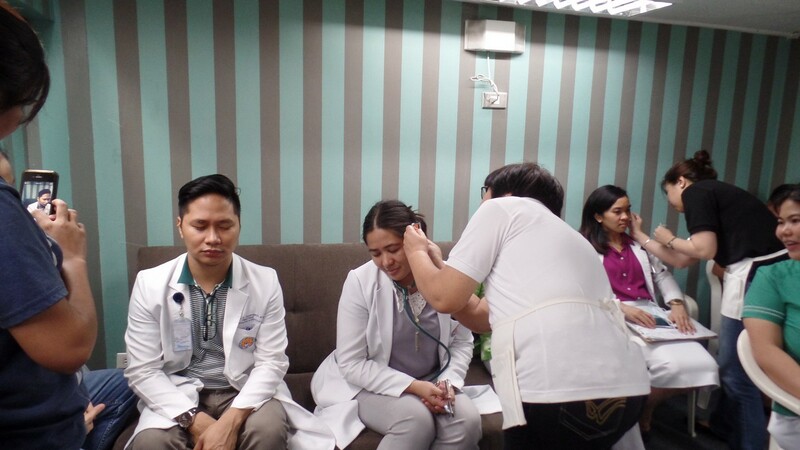 Doctors, nurses, interns, and staff were present at the orientation and they all had ear acupuncture. Everyone had a good snooze while sitting down at the conference room. They were all asking when will be their next treatment. 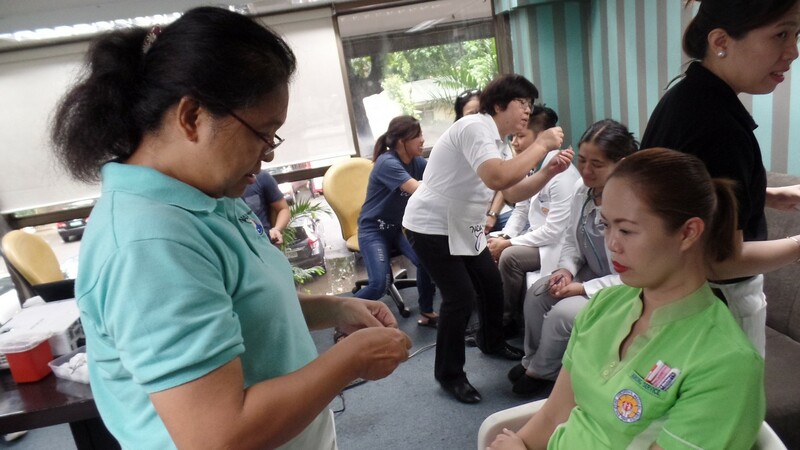 This was in preparation for the KYTHE-NADA coordination to give free treatments to the caregivers of children with leukemia and blood problems at PCMC. Dan Macalagay, KYTHE coordinator, informed us that PCMC provides Free Chemotherapy to the children with cancer. Parents, caregivers with the children start falling in line for assessments and consultation from 5am to 7pm. 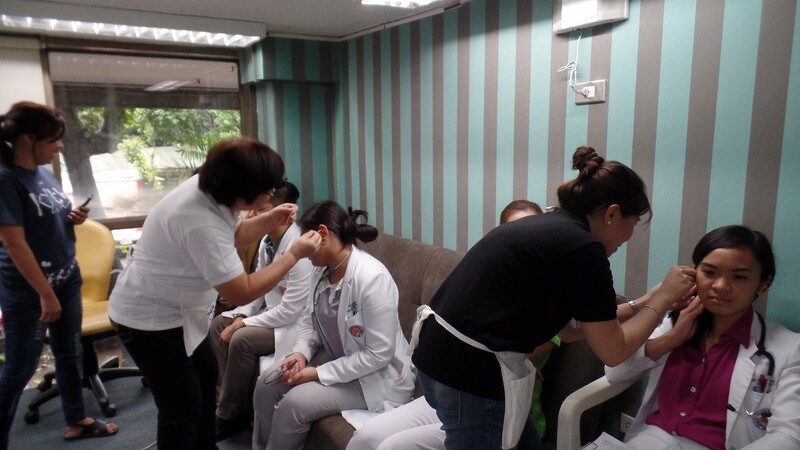 NADA Philippines has offered its services by providing free ear acupuncture to the parents and caregivers of the children. We shall start this Sept. most likely every Friday from 2pm to 4pm at the KYTHE office at PCMC. Volunteer ADSes are warmly welcome! Please sign in with Ms. Evelyn Dulay (+63 908 369 1598). Point location was presented Friday night. Our class consisted of 5 bilingual students: two Ecuadorians, two North Americans and one Spanish. Ages ranged from 21-48. After practicing on each other Saturday morning we set up clinic for friends and family. 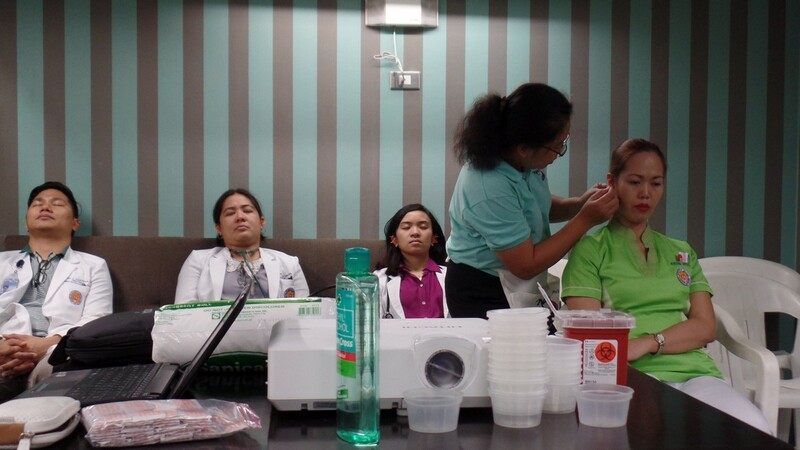 The first clinic day students treated ears. The second clinic day the students treated people with ears. With our didactic training we created a document to record information on each person the students practiced with. The students practiced on a minimum of 50 people. This allowed us to review unusual situations that arose during practice. It also allowed us to asses our work statistically. The students seemed to experience no cultural bias in performing the treatments. There were eight weeks between the first weekend’s class and the second weekend’s class. This allowed everyone time to achieve their required practice numbers. The settings in which they fulfilled their practice were extremely varied, bookstores, private homes, offices and an open market. In all the settings the recipients returned and brought friends and family because their experiences led them to want to share the feeling of wellbeing that they felt. NADA Philippines was remembered at the NADA International Conference held last May 29-31 in Oslo, Norway. Despite not being able to attend the Conference due to personal matters, NADA Philippines President, Ms. Janet Paredes, sent copies of the 4th Annual NADA Forum Proceedings to the participants of the Conference, sharing with the rest of the international community the experiences and lessons learned by NADA Philippines Acudetox Specialists (ADSes) while serving their respective communities.